We've deployed a new feature - user dashboard. It allows the user to control their ad units and campaigns in a single place. Advertisers can see their campaigns and adjust their daily budgets without leaving the page. 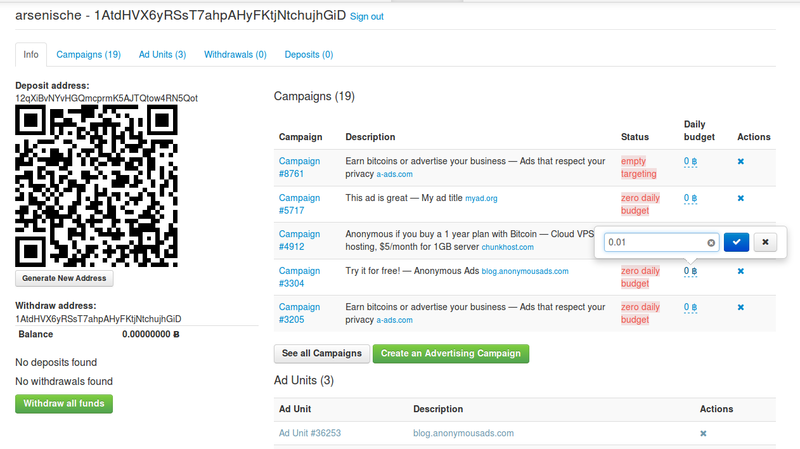 They can also deposit bitcoins to their user accounts (no need to fund individual campaigns any more). Users' funds are being used to automatically top up their campaigns with respect to their daily budgets (daily budgets for old inactive campaigns have been set to zero). withdraw the difference between the user's balance and the expected monthly expenses. Automatic withdrawals occur only when the amount to be withdrawn is higher than the withdrawal threshold defined in the settings page. Users can also withdraw all funds by clicking the button "Withdraw all funds". The minimum withdrawal amount is 0.0001 btc.